Fast-track project - six months start to finish - involving construction of a 20,000 SF, single-story addition on the south end of the stadium to provide an additional 236 bathrooms and four new concession areas. 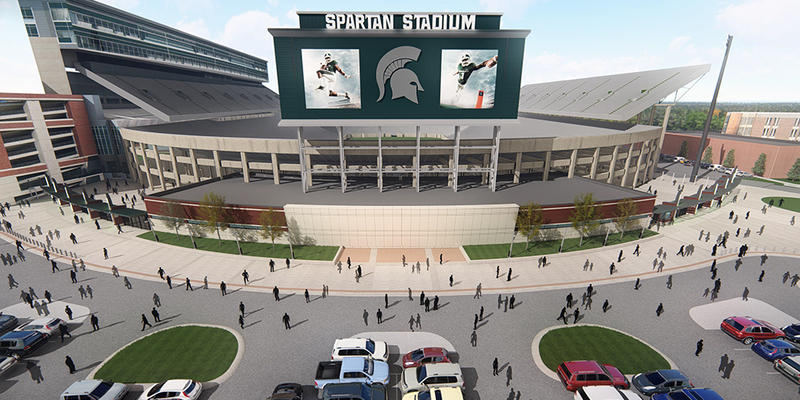 The project also includes expanding the pavilion area on the south end of the stadium to comply with the U.S. Department of Homeland Security recommendations to move ticket gates further away from the stadium. Prefabrication of plumbing components was utilized for the hundreds of sinks, toilets and urinals to meet the aggressive schedule. Plumbing tree systems were built in sections offsite, in a controlled environment, and delivered to the jobsite the same morning they were scheduled for installation. This process was also used for the hydronic piping systems. Granger self-performed all concrete work to further control the schedule and ensure on-time completion of the project prior to the 2017 football season.